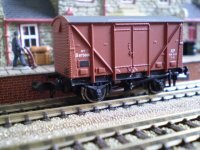 One each of these authentic BR goods wagons from the Graham Farish standard range. Since freight first travelled on the iron road back in the early Victorian era, railway companies had used wooden-bodied vans to carry boxes and crates and packages of all kinds. The goods inside would be protected from the weather outside, and from pilfering by any light-fingered miscreants who might otherwise have been tempted to help themselves to an item or two, while the vans made their leisurely way from A to B with a stop or two along the way. And a century or so later, in the post-war world of the 1950s, this was still pretty much the way things were done. By now the old private companies had been swept away, of course, and the railways of Britain had become British Railways. Wartime damage and neglect had left much of the system in a sorry state, with the rolling stock in desperate need of renewal and replacement. BR lost no time in embarking on a major construction program of every type of goods vehicle imaginable, and amongst these shiny new wagons were a batch of 12-ton vans designed for carrying fruit. The van bodies were made from the austerity era's top luxury material, plywood, and unlike most vans they not only had large ventilators on the ends but also a row of small ventilators low down on the sides. This kept perishable cargo such as fruit nice and cool, although in practice the vans were deployed just as frequently in general traffic as they were in the specialised role for which they were designed. Fast-forward a decade or thereabouts, to the early 1960s, and the fruit vans were still going strong. But by now BR was looking to the future rather than the past, and building a new generation of goods vehicles for a modern era. To fight off ever-increasing competition from road transport, they had to move freight by rail as quickly and efficiently as they could, and they reckoned that the way ahead was containerisation. No more time-consuming loading and unloading from lorry to wagon and back again, instead the customer just loaded the goods into a shipping container at his premises. The container could then be loaded on and off lorries and railway wagons on its way to its destination without the goods ever being handled at all. Genius! So BR built containers in various shapes and sizes, and flat wagons called 'conflats' to load the containers on to. The wagons carried the bauxite livery denoting vehicles fitted with vacuum brakes, but the containers were painted up in a variety of colour schemes. 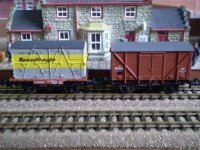 Our model is of a larger 'BD' type container in the smart grey & yellow 'Speedfreight' livery. For a few years the conflats and the fruit vans would have run alongside each other, until containerisation took over and the old vans were shunted off to the scrapyard. Soon the containers would get much bigger, needing special bogie wagons to carry them, and the old containers and conflats would be gone too, along with the steam locos and the first-generation diesels which had hauled them. 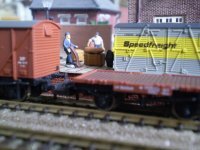 But you can recreate the changing world of 1960s freight trains on your layout with our BR Goods Set.